The New York State Assembly may soon consider legislation to ban bump-stocks, or referred to in the bill (A.8717) as bump-fire device or other firing accelerators. We oppose this legislation because of the broad nature of the proposal and how easily it could include other firearm accessories down the road. Also, state law is not an appropriate place to regulate such devices because visitors from other states where these devices are legal could unknowingly violate such a law while passing through or visiting New York State. Until the tragic shooting in Las Vegas, most people had no idea what a bump-stock was, and they were never used in crime. Furthermore, with practice one could pretty much duplicate what a bump-stock does with just your finger. Banning bump-stocks in New York will do one thing, it will prevent law-abiding New Yorkers from owning them. However, since bump stocks are available in most other states, this law will create a black market for New York’s criminal population. Laws like this make no sense and will never accomplish their stated purpose. To address the tragedy in Las Vegas, the focus should be on the individual who committed this horrendous crime. Why did he do it, how was he able to spend days setting up such an advantages tactical position and go unnoticed? The primary asset of the Vegas shooter was his tactical position, given that, he could have accomplished the same results with just about any firearm without a bump-stock. Another unanswered question is why did it take so long to locate the shooter, could strategically positioned police snipers have ended this tragedy sooner? None of this is meant to be criticism of law-enforcement but these are questions that need answers. Addressing these issues will go much further in saving innocent lives than passing a state ban on hardware. Call your Assembly and Senate representatives and ask them to oppose A.8717 and S.6918. Yes, we can defeat Andy Cuomo this November. That’s not just wishful thinking, it is a fact. We hear time and again that we cannot overcome the anti-gun vote coming out of the densely populated New York City area, is that true? If it is it’s only because we have not worked hard enough in the past, we must change that in 2018. Let’s look at the numbers, the total adult population in New York State is approximately 15 million people, a little over 57% of New York State’s adult population lives outside the New York City area. There were approximately 10 million adult New Yorker's who did not vote in the 2014 gubernatorial election, many of them were gun owners, that’s fertile ground and it’s where we need to cultivate this year. Most gun owners, unfortunately, are not members of SCOPE or other pro-Second Amendment groups in New York. Many of these folks are your friends, co-workers, union members and fellow gun club members, we need you to reach out to them. You are the key to our success in 2018. The board of elections in your community has all the resources you need to get gun owners registered to vote and then make sure those gun owners vote on November 6, 2018. This includes information on absentee balloting, including voting for members of the military. We need your help in defeating Andrew Cuomo and other anti-gun politicians in New York State. Cuomo is beatable with your help. Please help us recruit an army of gun owners to defeat Cuomo in 2018. The 2017 elections are over, and hopefully you helped elect pro-gun candidates to office in your local communities. The end of the 2017 elections brings the beginning of the 2018 election season. Yes, you heard me right, the 2018 election season is here, and our work begins. It is not overstated, to say that New York gun owners are facing the most important election of their lifetime. Let me say it again, 2018 will be the most important election of your lifetime. You will be voting to elect members of the New York State Legislature as well as the governor of New York State. Additionally, you will be electing, members of congress and a U.S. Senator. It’s a very big year to say the least. You have heard estimates on the number of gun owners in New York. Estimates range from four to six million New York gun owners. If we voted in a block, we would be the most pro-gun state in the union. Unfortunately, we don’t vote as a block, even worse, many gun owners don’t vote. Our fate ultimately hinges on how successful we are at getting gun owners out to vote and to vote pro-gun. Many people who consider themselves pro-gun, are not necessarily one issue voters. They consider other issues as well. When they vote they may consider a candidate’s stance on issues like taxes, economics or other social issues. We need to educate voters that the right to defend yourself and your family is the ultimate right to life. Remember that caricature of Uncle Sam, pointing at you and stating, “Uncle Sam needs you”, well Uncle Sam needs all of us to preserve freedom in New York State. All hands-on deck, if there are barriers between us we must bury them now. We need gun shop owners, gun show operators, gun clubs and any organization that considers itself pro -gun to join in the fight. First and foremost, we must get gun owners registered to vote. If you are not registered you can’t vote. We need voter registration forms in every gun shop, we must have voter registration tables at every gun show. We need to educate gun owners on how to vote including absentee balloting. We also need to identify the pro-gun vote and make sure it gets to the polls on election day. One final point on registering to vote. Gun owners tend to be independent and many of us are inclined to register as independents and not a member of a political party. When you register, I would encourage you to register to a political party because not doing so gives up part of your voice. When you register to a party you have the right to vote in that party’s primary, you have a say in who that party’s candidate is in the November election. Don’t forfeit that power, register to a political party. As a party member, you can obtain signatures and run your own pro-gun candidate against an anti gunner in a party primary. The other important thing to consider about primaries, is that fewer people vote in them, making primary votes more impactful. This means that an organized get out the vote campaign in a primary, can sometimes rid us of an anti-gun candidate who might be more difficult to defeat in the general election. Good news on the Second Amendment Guarantee Act (SAGA – H.R. 3576). Representative Chris Collin’s legislation now has 14 co-sponsors. They include representatives from California, North Carolina, Louisiana, Maryland, Pennsylvania, Tennessee, Texas and West Virginia. Here in New York SAGA co-sponsors include Representatives, Tom Reed, Claudia Tenney, Elise Stefanik and Lee Zeldin. Call these reps and thank them for their support. If you live in the Syracuse district Representative of John Katko call his office and ask why he has not joined on as a co-sponsor of SAGA. Our hearts and prayers go out to the victims of the recent mass shootings. Not surprisingly, it has not taken long for the enemies of freedom to attempt to gain some political advantage from these terrible tragedies that have their roots in pure evil. The Texas church shooting highlighted a point we have been making for a long time. The best defense against a bad guy with a gun is a good guy with a gun. The media has done a good job of playing that down. As you all know law-abiding gun owning citizen Stephen Willeford, put an end to the shooter’s rampage, with his AR-15 rifle. The only thing that would have made this better is if someone in that church had a firearm, even more lives may have been saved. This was in Texas, I can’t help but wonder why no one in that church was armed. Have anti-gunners with their lying rhetoric attached a stigma to concealed carry, making folks reluctant to carry? If they have they should be held accountable for their rhetoric because it’s costing lives. Consider this, 70% of mass shootings end within 5 minutes, average police response time to such tragedies is 11 minutes. You can run, hide under a table or pew and hope for the best or you can fight back. Texas hero, Stephen Willeford proved there is no substitute for a good guy with an AR-15. Furthermore, we know the shooter had a bad conduct discharge from the Air Force and had a record of domestic violence, by law he should not have been able to purchase a firearm. That’s more evidence of government ineptitude and more evidence of how you cannot count on, or expect the government to protect you from a violent attack. Like New York’s SAFE Act, restrictive gun laws only restrict law abiding citizens, making us more vulnerable to evil people like the shooters in Texas and Las Vegas. The battle is against evil, perhaps too theological for anti-gunners to understand. Will Rights Be Kept or Lost Next Year? As we would expect, when a mass shooting is committed by an evil person, the media and liberal left cries for more gun control. What is interesting about this case is that the killer bought his guns after passing background checks. This should not have happened because of the past history of the murderer, who had numerous interactions with the military and the law. This should have made him ineligible to purchase firearms. Unfortunately, the government fouled up both in the military and civilian arena. The killer received a Bad Conduct Discharge from the Air Force, and his penchant for domestic violence got him in trouble while in the military and with local law enforcement. He served time in prison, yet with all of these violations, was not reported to the FBI and placed in the NICS data base. Compare this with New York and the SAFE Act where people who are falsely reported are automatically placed on the NICS data base and they are unable to legally buy or possess guns. Go figure. Predictably, the liberal leftist politicians are calling for more gun control laws. Some want a law that would call for an ex parte confiscation of firearms like the Lautenberg Law that requires people who may have had a misdemeanor conviction for domestic violence to lose their Second Amendment rights. This is a federal law, yet a bill in the NY Assembly has been submitted that would do the same thing with a mandate attached to require law enforcement to confiscate the guns even if the officers decide that there is no danger to the people involved. A person may have had the conviction before the law was passed and may have purchased a gun legally at the time. However if it was recently discovered that if by some quirk in the law requiring a background check, like for employment, and it showed the misdemeanor conviction, all of a sudden, he is required to turn in all his guns because he is not eligible to possess a gun. He might have gotten the misdemeanor conviction by bad advice from his lawyer. Let’s say that he had an argument and he asked for a divorce. His wife wanted to hurt him so she accused him of a violent act and the police were called. They took the report and he is charged with domestic abuse. Now, he is faced with an expensive court case, so the lawyer suggested that he save several thousand dollars by pleading to a misdemeanor which could end up in an affordable fine and a reasonable legal fee. So, that is what he did. He was a fine, outstanding citizen after the divorce, forgot about the incident and went on with his life until the misdemeanor showed up in his record. Now, his property has been confiscated and he has little chance of getting it back. An honest citizen is turned into a person who has lost a constitutional right because of this law. It is thought by many that the liberal left is looking for every opportunity to make gun ownership difficult for all citizens. We know that only about one quarter of one per cent of American gun owners misuse their guns. The proper way to deal with the problem is to deal with the cause. It is not guns that cause the mass murders. They may be a tool used by evil or deranged people. We think of Timothy McVeigh who killed three times as many people as Pollock in Las Vegas by using a truck with a bomb made of fertilizer and fuel oil. We have to be convinced that the only real common factor in any mass murder is the person doing it. If all guns could be confiscated we would still have mass murders. This was shown recently by the terrorist in New York City using a rented truck and mowing down people in a bike path. It is easy to obtain a vehicle. No background checks outside of credit checks. A driver’s license is necessary and once the finances are approved the guy drives a vehicle. If he doesn’t have money, how hard is it to steal a car? The liberal news media is also for confiscating guns and looking for any reason to do so. They don’t care that the person may not know they are in violation of any laws until the police come knocking on the door with an order to take all firearms from the person. In a family home, they may remove the guns owned by other family members. Then there is a huge problem getting them back. The “due process” can take years, require legal assistance and reduce the family bank account. The SAFE Act is a good example of that, too. People have had their constitutional and civil rights violated by false reports by hospitals who can report a person as involuntarily admitted when the person came in totally voluntarily. If the report was made as an involuntary admission, it goes to the Office Of Mental Health. From there it goes through a series of bureaucracies and ends up at the County Clerk’s Office in Upstate New York if the person has a pistol permit. The accused person must surrender his pistol permit and all his guns, including rifles and shotguns. There is no hearing or due process connected with this law. When this happens, the state gives the FBI a reason to add that name to their NICS base. Then, the accused person is considered guilty and he or she has to hire an attorney to start a process to investigate the false report to prove innocence. If successful and the aggrieved person wins, they get an order for the return of their suspended pistol permit and the handguns. The long guns are not returned. In order to get the rifles and shotguns returned, the person must file an Article 78 to a Supreme Court Judge and needs the assistance of an attorney. The costs involved can be more than the value of the guns, so the person has the loss of property without compensation. The anti-gun politicians are happy to see this happen and look for more ways to confiscate guns from honest people. Since criminals don’t obey laws, they passed one that will be obeyed. They like this idea. The politicians will submit such laws and the liberal left will write editorials supporting these infringements on the right to keep and bear arms. In New York, assemblymen, senators and governor will be running for office next year. For those who believe in constitutional law, the right to keep and bear arms, property rights, due process and fairness in law will have the opportunity to vote for the politicians who agree with them. We get the government we deserve. What do you deserve? Until about 1925, few Americans questioned a person’s right to own a firearm for protection of life and property. In the eighteenth century, armed farmers helped win our independence. Firearms were essential for homestead defense against Native American attacks and wild animals in the nineteenth century. As the nation expanded westward, the Colt revolver became the “Great Equalizer” in mining camps and “cow towns.” Ranchers and farmers would not have agreed upon much except the usefulness of Henry and Winchester rifles. However, America was changing. Power farm equipment replaced horses. There was much less need for ‘hired hands’ for harvesting. Millions of these now unemployed men and their families migrated to the cities where they joined the throngs of immigrant families. The dramatic increase in urban population gave cities increasing political power over rural areas. By 1910, census data indicated that a majority of the population lived in cities. Rural people felt comfortable with firearms and knew how to handle them safely. In the densely populated ethnic neighborhoods of cities like New York, firearms were viewed as a dangerous menace. In the southern part of Manhattan, criminal street gangs used handguns to eliminate rival gang members and for extorting money from shopkeepers. In 1903, two rival gangs, the Eastmans and the Five Points Gang had a five-hour shootout. When police arrived, both gangs began firing at responding officers. The firearms used by the criminal gangs were not illegal to possess but there was a ten dollar fine for carrying a concealed firearm in the city. State Senator Timothy Sullivan represented this part of the city and instinctively saw an advantage in proposing a gun control law in Albany. His “Sullivan Law” took effect in 1911. It made buying or selling a handgun a felony in the state unless the person had a license for the handgun. Licenses were required for state residents if a firearm was small enough to be concealed. Possession of an unlicensed firearm would be a misdemeanor but carrying the weapon became a felony. The law was a “may issue” statute. Police were given authority to decide whether or not a person would receive a concealed carry license. The jury is still out on whether or not Sullivan actually believed in gun control. At the time, he was also the head of the New York City Democrat political machine “Tamany Hall.” For getting out the vote on Election Day, prepaid drinks were available at local saloons for those who voted “the right way.” Intimidation at the polls was also a useful method of guaranteeing votes. “Big Tim” Sullivan had a working relationship with the leaders of both the Eastmans and the Five Points criminal gangs. He is said to have also had his own “soldiers” for use on Election Day. Passage of his law would make it possible for his own men to be among the few who could legally carry firearms in the city. New York City historian George Lankevich has claimed that the law’s motivation was for Sullivan’s friends on the police force to plant handguns on his political rivals’ thugs and have them arrested. The Sullivan Law was the start of gun control. In 1927, Congress ended mail order handgun sales. Due to a rash of bank robberies and Prohibition Era use of Thompson submachine guns by gangsters, Congress passed the Firearms Act of 1934. It regulated machine guns plus rifles and shotguns with shortened barrels. The Firearms Act of 1938 helped the states to enforce their own recently enacted gun control laws by requiring individuals and manufacturers to have a federal license for making, sending, receiving, or selling firearms. Elected politicians since Timothy Sullivan have capitalized on gun-related violence for personal gain. They are aided and abetted by the news media. The spotlight needs to be on the real causes of violence in our society: the constant failure of urban elected officials to prosecute under existing laws those individuals who are killing and injuring others with illegally possessed handguns; the insufficient resources for treatment of people with mental health issues; the proliferation of movies, videogames and song lyrics which glorify violence while degrading the value of human life. We need to express clearly to the younger generation why Second Amendment rights are important for all law-abiding people. Erosion of the Second Amendment is a civil rights issue and should be constantly portrayed as such whenever an opportunity presents itself. Finally, those whose ultimate goal is to end the individual right to keep and bear arms wait for the public emotion which follows each mass shooting. With perceived public support, they incrementally push forward with their agenda. Without a solid constitutionalist majority on the Supreme Court, we will likely have to deal with ongoing erosion of the Second Amendment. Thanksgiving is over and so is Black Friday. People are getting their first rush for the “Holiday Season” and of course, it starts with the big sales and the focus on spending money. There is no more “Merry Christmas.” What used to be a religious holiday to celebrate the birth of Jesus Christ has become a season to stimulate the economy and provide profits for merchants and factories. Check out the local newspapers, fliers and electronic media. It is filled with ads for sales of products. Some merchants and businesses depend on this holiday to end the season in the black because of the surge to buy gifts. Some say the American custom is to spend money you don’t have to buy stuff you don’t need to impress people you don’t even like. The “holiday season” enhances this thought. The society has changed so much thanks to the liberal leftists that the mention of Jesus is forbidden in some stores. They employees must wish their customers a “Happy Holiday” instead of a “Merry Christmas.” Nativity scenes are forbidden to be placed in government owned places because some atheists or people of faiths other than Christians “might be offended.” Baloney! This started as a Christian holiday and has denigrated to a time for commerce. While the Christians do celebrate the birth of Christ, they do not infringe on other beliefs or non-beliefs. Who objects to Jews celebrating their holidays like Yom Kippur? Anyone object to Muslims celebrating the Fast of Ramadan? There doesn’t seem to be any outcry to do that. Maybe it has something to do with Christian spirit and practicing the religion as it should be practiced. Traditionally, Christians used the holiday to come together for the traditional Christmas dinner and exchanged gifts in the tradition of the gifts brought by the Wise Men when Jesus was born. It became a true holiday complete with church services and prayers. That too, unfortunately, has faded. This column has long expressed the opinion that politics was all about power and money and it seems that the American way of living has been strongly influenced by the same philosophy. A major factor on everyday decisions is, “What is the cost?” That is understandable since this is a capitalistic society. We have been taught that is we worked hard we could be successful and have a good financial future. In so many instances, success is measured in dollars. That could have a major influence on the shift in the attitude about Christmas. Where family values and traditions were featured during the Christmas season, it seems like the major discussion about the celebration is now, “What did you get for Christmas?” The more the kids got or the more expensive the gift determines how merry their Christmas was. Still, the message of Christmas does resonate in some aspects of the season. We refer to the concept that it should be a time to help the unfortunate and share some of our bounty. Jesus preached about the value of charity and how those who had the means should take care of those who are less fortunate. We get mailings every day from organizations asking for financial help for the poor, aged, disabled and unfortunate. They hope that there is some compassion that leads to generosity. Therefore, there is competition for money between compassion and commercialism and generally speaking, commercialism wins. The “what’s in it for me” motivation usually wins. However, it is easy to be generous and there are convenient opportunities to help the unfortunate in an easy manner. At most stores and malls, shoppers can find people who are standing by the Salvation Army Red Kettle giving shoppers a chance to drop in a couple of bucks that can make a big difference to an unfortunate person or family. For each donation it can be pocket change or a five of ten dollar bill, maybe more, the Salvation Army motto of ‘’Doing the Most Good” comes into play. Of all the recognized charities, this one has the highest ratio of low overhead to the amount given for those who receive the help. Many organizations do wonderful work, but this one has an enviable reputation for efficiency that few can match. When a disaster strikes, more often than not, the Army Is first on the scene to set up emergency kitchens that feed those affected and to set up shelters. This was recently shown during the storm that devastated Puerto Rico. They beat the government teams by a significant margin. So, during this Christmas season, when you shop for gifts and you see the Red Kettle, perhaps you can remember the traditional purpose of Christmas and think about others who may be in need of necessities. Maybe you can consider not buying a small unnecessary gift and invest the money in a worthy charity. A couple of bucks you won’t miss can mean a decent Christmas dinner for a hungry poor person. Your money, your choice! From time to time when things seem to get blurred and confusing it is important to step back and review why we are here and what are our goals. The latter is very clear. To stop any and all forms of infringement on The Second Amendment. Why we are here is a little more difficult and can be answered a bit differently in one’s mind. It is for this reason SCOPE as an organization has a mission statement. It is constructed in a manner to offer guidelines as to how we operate. There have been those as of late that have chosen to isolate themselves within a small segment of our political arena. To vilify those that do not emulate the perfect conservative and shun support from those that may have different views on issues not related to The 2nd Amendment. SCOPE has always been a bipartisan organization and this philosophy has served us well through the years. I offer below, for your review, the official SCOPE Mission Statement as listed on our website. The Shooter’s Committee on Political Education was founded in 1965 by a group of firearms owners in Western New York. SCOPE is a civil rights organization focused on the protection and preservation of the right of firearms ownership as guaranteed by the Second Amendment to the Constitution of the United States. The founding of SCOPE and its subsequent growth were in response to the attacks on the Second Amendment as being outmoded in modern times or not being applicable to the rights of individuals. In other words, firearms ownership, much less use, was no longer considered by some to be politically correct. While SCOPE’s role is focused primarily on the political process, it is an issues oriented organization. It does not align itself with any political party nor does it endorse any candidates for elective office. Our function is to counter assaults on the right of firearms ownership. This entails providing legislators and executives with timely and accurate information to support sound decisions. In a free society, it is inevitable that the needs of the public will come into conflict with the rights of the individual. The SCOPE legislative team reviews all proposed firearms legislation for its impact on the legitimate firearms owner, its economic cost to the state, and its potential for achieving its stated objective. In developing our position on a specific piece of legislation or regulatory proposal, SCOPE goes through an extensive review process. All proposals are examined in light of their relationship to legitimate state interests and their potential for achieving objectives substantially related to satisfying those interests. 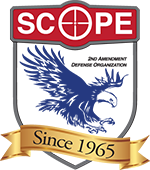 SCOPE’s purpose is to maintain the right of individuals to own and use firearms for lawful purposes. The Supreme Court in its landmark 2008 decision in District of Columbia v. Heller clearly upheld this right. We do recognize that we live in a real world where individual rights may conflict and the state has a legitimate interest in resolving those conflicts. Any regulation by the state, however, must serve an important governmental objective and must be closely related to the achievement of that objective. SCOPE will oppose, with all its resources, any proposal that is not based on sound technical grounds or that infringes on the rights of firearms owners for the purpose of promoting a political philosophy, advancing a social theory, or as an emotional response and is not based on clear Constitutional grounds. SCOPE’s mission has always been to keep legislators informed and educated on pending and proposed bills affecting gun owners and sportsmen. We have been successful for 40 plus years. And for 40 years SCOPE has been educating the voting public on the importance of their involvement and vote. In 2013 the efforts and successes of 40 years of advocacy for gun owners all changed in the dead of night with a midnight vote. SCOPE will not stop and is now expanding to litigation efforts as well as education of our legislators and voters. On July 29, 2017, SCOPE joined Congressman Chris Collins at press conferences in Buffalo and Rochester, to announce that he has introduced the Second Amendment Guarantee Act (SAGA) H.R. 3576. SAGA would repeal the portion of the un- SAFE Act pertaining to semiautomatic rifles and shotguns. The unSAFE Act broadens the definition of what an assault weapon is under New York law, and introduces gun confiscation to New York State. The unSAFE Act is groundbreaking in the sense that it brings us something that most gun grabbers told us they would never do, confiscate your rifles and shotguns. I guess confiscation is their new idea of a “sensible gun safety” law. If you own one of these firearms you are required under the Act to register it with the state police. You cannot transfer the firearm to any New York resident, with the exception of an FFL dealer. This includes, your spouse and your children. You have a favorite rifle or shotgun, maybe a sentimental piece, you would like to leave to your son or daughter, Andy Cuomo says NO! SAGA would repeal this egregious section of the unSAFE Act. For SAGA to pass we need all on board, you, me and of course congress. I am very disappointed to report that as of this writing, New York Congressmen John Faso (202) 225-5614, and John Katko (202) 225-3701, both who have claimed to oppose the unSAFE Act, have not signed on as cosponsors of SAGA H.R. 3576. Please call them and urge them to cosponsor SAGA, they need to hear your voice. There is good news, New York Congresswomen Elise Stefanik, Claudia Tenney and Congressman Tom Reed have joined Congressman Chris Collins as cosponsors of SAGA. Please let these leaders know you are grateful for their support. SAGA is also picking up support from congressman from California and Pennsylvania. One more thing we need from you, if you have friends and family living in other states, tell them about SAGA, ask them to contact their friends and families in their states and to contact their congressional representatives to support SAGA. We’re creating our own little pyramid scheme, you are our greatest ambassadors keep spreading the word. Finally, this November’s elections are local, you’ll be electing town boards, mayors, city councils and many other locally elected officials. These local elections, referred to as off year elections, are often viewed erroneously by many, as not important, voter participation is often the lowest of any election cycle. For us who are advocates for the Second Amendment, this presents a great opportunity, during low turnout elections your vote becomes magnified, it carries more weight and can turn an election, so register and vote. Gun owners have a terrible history when it comes to voting, many of us complain a lot, but for whatever reason, many don’t vote, that must change. Let me be blunt, the gun owners who stay home and don’t vote and support pro-gun candidates are as responsible for the passage of the un- SAFE Act as anyone. One more point on local elections, many of those local candidates will one day be running for state assembly, senate and congress, your local elections are the best place to weed out the good from the bad now, so register, vote and ask others to do the same. Someone much wiser than me once said, you get the government you deserve. The SAFE Act is still a topic of discussion, especially now that Chris Collins is sponsoring the Second Amendment Guarantee Act (SAGA, HR 3576) which, if passed, would negate several of the most objectionable provisions of the law. People may want to discuss the SAFE Act, and it is up to members like us to educate them on the uselessness of the law when it comes to diminishing “gun violence.” The discussion starts at the beginning of how it was passed, literally in the middle of the night with no three day waiting period for adequate debate or input. Governor Cuomo and corrupt politicians (Sheldon Silver and Dean Skelos) pushed it through the Assembly and Senate. The two legislative leaders were convicted and sentenced for corruption on other matters, Silver’s conviction was overturned and he may face another trial, but neither is serving their sentences. The point is that the origin of the law was passed in a dishonorable way by dishonorable people. It was called a “message of necessity” although some of the provisions didn't go into effect for a year, and others are not in effect now. What it did was focus on ways for the state to deny honest gun owners four constitutional and civil rights without due process. Governor Cuomo and his toadies thought, and still think, that is necessary. It banned many semiautomatic rifles and shotguns. It started out banning any rifle or shotgun that had a magazine that could hold more than seven rounds. It was so badly written that it didn't exempt law enforcement officers from that provision. Needless to say, that was quickly corrected and also because of the uproar that many handguns came with ten round magazines, ten round magazines became the limit for civilians. Nothing has been litigated on that aspect so far. Perhaps there are prosecutors smart enough to realize that bringing stupid cases to a trial can make them look stupid. Ridicule is not something politicians and bureaucrats like. Add some more ridiculous provisions of the SAFE Act. It still has the provision that the state can make people have a background check when they buy ammunition. This has not been put into effect yet because the State Police don't have the equipment to run the state equivalent of the NICS check. "Stupid is as stupid does," said Forrest Gump. This whole law serves as a good example of that saying. Then, the law requires a background check for any private sale or transfer of all guns. So, if Joe up in the North country wants to legally sell his Winchester 94 to his close friend and the nearest FFL dealer is forty miles away, they have to drive the eighty miles, pay ten bucks for the NICS check (if the dealer will do it) before the sale is legal. There are rumors that in some places guns are exchanged with cash and a handshake without going through the legal process. The question hasn't come up and been publicized about how do you prove a bill of sale dated before 2013 wasn't involved in a gun purchase? That could be problematic in some jurisdictions. The other problem with that law is it prevents the Amish from legally buying a gun. In order to perform a NICS check, the FFL dealer needs a photo ID. The Amish, by their religion, don't have photo IDs so they cannot get the background check. That is also a good question to use in the debate or discussion. “Why do you think the Amish are such a dangerous society that they shouldn't be able to legally purchase a firearm? Getting a stupid look from the person who has to think of a logical reason for that is worth the time and effort to ask. As you keep asking and interjecting these questions for which there is no logical answer, you are making the opponent crumble. How does he defend the indefensible? Now, you are getting warmed up and finding the chinks in the SAFE Act defender’s armor. You have showne the stupidity of the law on the cosmetic restrictions of the guns. You always have the undeniable truth that THE ONLY THING THAT MAKES ANY WEAPON DANGEROUS IS THE PERSON HOLDING IT. A hammer can be used to build a house. What do you call that? The obvious answer is that it is a tool. What do you call the same hammer if it is used to smash a person’s skull? The obvious answer to that is “a weapon.” Again undeniable logic! This is the “weapon” you should use in the debate or discussion. Truthful statements that can't be refuted or rebuffed are winners. So, in desperation, your opponent may counter with, “The background check will make it more difficult to buy a gun.” And the answer to that is the degree of difficulty is not a factor. Many drugs are totally illegal and there is no place to buy them legally. The addicts don't seem to have a big problem getting their supply. The same thing is true for firearms. If there is a buyer for a product, you will soon find a seller. That is a law of commerce. The anti-gun debater might come up with “most guns involved in crimes come from out of state.” The answer could be. “Most illegal drugs come from out of the country.” State or federal borders don't stop criminal commerce. Another argument comes up on the subject of limited capacity magazines. The opponent might say “If it wasn't for the high capacity magazines you wouldn't have mass murders.” Then you discuss the ease and speed of changing magazines to reload. Let them think a moment about this thought. The atrocity caused at Sandy Hook by Adam Lanza is a good example of that fallacy. He could have committed all those murders with an old fashioned double barrel shotgun. He was murdering little children. Who could stop him from reloading? Again the danger comes from the criminal not the weapon. You can bring up a response by relating to drunk driving deaths and that more than half of the homicides involve drugs or alcohol. Drugs are illegal, but if we use the “logic” of the SAFE Act in this vein, we can argue that they also are inert until a person uses them. So, if we make the purchase of alcohol more difficult, that will cut down on drunk drivers. Prohibition was one of the greatest failures in our history. Difficult to get alcohol? The people who wanted to drink were not significantly inconvenienced. Criminals made fortunes during the Roaring Twenties. Finally, the stupid law was repealed , as the SAFE Act should be. Using this analogy, maybe we could reduce drunk driving and alcohol abuse if the bottles were smaller. How about a law that would forbid any alcoholic beverage to be in anything larger than a pint bottle? How about limiting alcoholic beverages to no more than 20 percent alcohol content? Limiting magazine capacity makes as much sense. Speaking about the analogy using cars, try this one. There is no place in NY where a person can legally go faster than 65 MPH. Therefore to make our roadways safer, wouldn't it make sense to pass a law to make all cars sold in this state have a governor on it that would not allow the car to go faster than the legal limit? Speed kills and how many lives could this save? The only reason a person could want to have an automobile that can exceed the speed limit, is because he WANTS to exceed the speed limit. Andrew Cuomo grinned as he declared that “Nobody needs 20 rounds to kill a deer.” Well, nobody needs a car that will go faster than 65 MPH. Of course police and emergency vehicles (and probably the governor’s car would be exempt). Of course, being New York and the fact that fines for speeding is a good source of revenue for governments makes it acceptable in Albany to have these dangerous cars on the road. (A bit of sarcasm here). The biggest problem for honest gun owners is that they can lose four constitutional and civil rights without due process. No law abiding gun owner wants criminals or mentally impaired people to possess firearms. Felons are forbidden to have guns. However, the issue of mental impairment is causing a big problem. The case involves a retired law enforcement officer who was having a problem with insomnia and went to a hospital for treatment. He was released and a couple of days later the police came to his door and confiscated his guns and pistol permit. Others are part of this action. One is a woman who voluntarily went to a hospital because of a medication problem. She was falsely reported as an involuntary admission. Same thing happened to her. Some people (not a part of this case) lost the four constitutional and civil rights because of the medication they were taking. All got notices of the confiscation and the removal of gun ownership and their guns. There was no hearing and we found out that the government is exempt from HIPAA laws. They can do what they choose to do. So far, the woman involved in the Montgomery Case had her permit reinstated because of the involvement of a good lawyer and investment of money. But, there is a big glitch for the possession of her guns. Being charged is enough for the state to notify the FBI and she, and the others now can't pass a NICS check. There is no easy way to get the stain of the report off the list. So why cannot those who are falsely accused possess firearms? The state has no interest in rectifying their mistake. They refuse to rectify their mistake. They refuse to contact the FBI to get the names of the wrongly accused persons removed from the list. Where is the justice here? The other abomination is when a pistol permit is suspended and the handguns are confiscated the owner’s long guns are confiscated too. When the pistol permit is reinstated the police have to return the handguns, but not the long guns. In order to get the rifles and shotguns returned, a Supreme Court Judge has to be served with an Article 78 to return the confiscated property. The filing fee is close to $400 and the average lawyer’s fee is more than a thousand dollars. The legal costs may be more than the gun is worth and not be in the budget of many people who are affected. Perhaps this is another ploy to deny gun ownership. The power to tax is the power to destroy. So are expensive processes to regain constitutional rights. So, if you are debating, arguing or writing letters about the SAFE Act, this article may give you some good talking points to prove that New York has corrupt politicians running Albany and the laws are strictly to limit the Second Amendment rights for honest citizens. It is up to us to convince the corrupt politicians that the law is a dismal failure and does nothing to reduce “gun violence” because CRIMINALS DON'T OBEY LAWS. Go forth and preach the gospel of logic and reason. To those of you who were unable to attend SCOPE’s members meeting on April 22nd, I’ll begin by introducing myself. My name is Tim Andrews and your Board of Directors elected me president of SCOPE at our April meeting. Most of you probably don’t know me but I do have some history with SCOPE. I’ve been a SCOPE member for about thirty years and I’m currently an Endowment member. Beginning in the mid ‘90’s I was the Chairman of the Monroe County Chapter and later went on to become president for about five years into the early 2000’s. You might be asking what brought me back after all these years? Well like many of you I was concerned with the level of infighting that was taking place within our organization. I contacted some folks in SCOPE leadership and offered my services to help resolve some of the differences. My intentions were to help mediate and I made it clear on several occasions I was not interested in an official position. As time went on I learned that Tom Reynolds was not going to seek reelection as SCOPE president. At that time, some members asked me if I would consider running for president. I called Tom to confirm his intentions and I told him I would not consider running if he decided to seek another term. I’m grateful for Tom’s service to SCOPE; he served during a trying time and did a great job of guiding us through some difficult waters. We owe Tom a debt of gratitude. So, I’m the new guy at least in some sense. I was not a party to the divisions of the past year and the past is behind us. Allow me to share a few of the reasons I decided to once again serve as SCOPE’S president. I’ve always been a devout patriot. I love America and the freedoms we all share, especially the one freedom that guarantees all others, the Second Amendment. I’m a life member of several other pro-gun organizations, but in my view, there is no more effective defender of the Second Amendment in New York State than SCOPE. In the real sense of the word SCOPE is a true grass roots organization. We are the only pro-gun organization in New York with a local chapter structure that, forgive the phrase, gives us boots on the ground in every corner of New York State. You are more than a member you are part of our team, you are the lifeblood of SCOPE. If you live in an area where there is a chapter I would urge you to get involved. Offer your voice, your input. Run for office in your chapter or next year consider throwing your hat in the ring for a state office. If there’s no chapter in your area consider starting one. SCOPE is your organization. I understand how frustrating it is to be a gun owner in New York. We have all, probably at times, felt like throwing our hands in the air and saying what’s the use. I urge you don’t give up, giving up is the only way Cuomo and his cronies can win the ultimate fight. We have lost some battles but we have not lost the war. With the addition of Neil Gorsuch to the U.S. Supreme Court, our prospects of overturning unconstitutional laws like the (un)SAFE Act have greatly improved. We will continue our efforts in the courts. The gun grabbers in the New York State Assembly do have a solid majority, however, we do have a tepid pro-gun majority in the Senate. With divided government in Albany it’s possible to move pro-gun legislation with some creative horse-trading between New York City Democrats and downstate pro-gun legislators. SCOPE is retooling our strategies to advance a pro-Second Amendment agenda in Albany. More details will soon follow but I want to let you know that SCOPE is working on proposed legislation in the United States Congress to repeal unconstitutional state laws like the New York (un)SAFE Act. Our proposal would use the Due Process Clause of the Fourteenth Amendment that provides a means for the Federal Government to repeal state laws that violate the constitutional rights of their citizens. Stay tune more will be forthcoming. We are all aware of the anti gun bias that exists in today’s media. It’s a problem that President Trump experienced as well and he taught us how to overcome the lying and deceitful media. President Trump’s deft use of the internet and social media, allowed him to do an end run around the media and successfully delivered his message to voters. In the next few weeks you will see a new and improved SCOPE website as well as a presence on social media. An electronic presence gives us an opportunity to reach not only gun owners but non-gun owners as well. Opportunities to educate the public on law abiding gun ownership to correct the lies and deceptions that unsuspecting New Yorkers hear in the media almost every day. SCOPE is reloading; we are fine-tuning our efforts in Albany and tightening our business model. You, our members are still and always will be the tip of the spear. SCOPE needs you! We need you involved, recruit a member, if each of us could recruit just one member we would double our membership. Talk to your family and friends, call your legislators and let them know you expect them to honor and defend all the constitution including the Second Amendment. As always please contact your local chapter, any officer or me with any questions, concerns or suggestions you may have and I look forward to a successful future. Thank you for your continued support.